Over the last ten years, with the publishing of CK Prahalad’s book The Fortune at the Bottom of the Pyramid and with inclusion gaining ground as a national buzz word, companies have been looking in larger numbers at rural markets for all sorts of products. Yet for every success in rural India, the marketplace is littered with many, many failures. What has been the problem? From my vantage point inside a company that operates predominantly in villages, I have a first-hand view. Not a week goes by when we are not introduced to a company with a product opportunity that they would like us to help them market in rural areas. It is an innovative product they tell us, specifically designed to solve a problem, meet an urgent need. And it is affordable. Shouldn’t that be enough? People from the villages should flock to it. The greatest differentiator of humans and our triumph as the alpha species on the planet has been our increasing ability to record and share our collective knowledge. With this ability, each new generation, rather than reinventing the wheel, can stand firmly on the shoulders of those before to reach further. Today with the internet we can do this better, faster and among more people than ever before. Wikipedia is an incredible example of this. Today Wikipedia has over 15 million articles contributed by several hundreds of thousands of people and is one of the largest and most actively accessed public repository of human knowledge. These articles are in 281 different languages. Yet almost 30% are in a single language – English. No surprise. The top ten languages – all western European with the exception of Japanese and Russian, account for almost 70%. I’m still not surprised. I scroll down the list of languages on Wikipedia, sorted by their article count, searching for Indian languages. Right away I pass Chinese (Mandarin) at number 12. With about 331,000 articles it is just close to 10% of English. But 12 is not a bad rank. I keep going expecting to find Hindi and Tamil in close succession....I see Ukranian (15), Vietnamese (17), Indonesian (21), Arabic (25), Lithuanian (28)..Volapuk (31)... I’ve never even heard of Volapuk. I click the link. For tens of thousands of years of human history the world over looked like our village landscape - no running water, no electricity, no cars, no phones, no printing press and low literacy. You have to wonder then how all of a sudden some parts of the world experienced an explosion in innovation and enterprise over the short span of a few hundred years to bring this all about. What was the driver? Surely it didn’t happen because of a king handing out gold coins or jewels from his coffers to the peasants (‘financial inclusion’?). Some time ago I was lamenting the difficulty of getting new product information to people who live in the villages – no phone, poor road connectivity - and my husband very helpfully offered up that it sounds like we need to have heralds, messengers and town criers like they did in medieval Europe. That got me thinking. A little bit of scouting turned up that in medieval Europe, messengers were hard-working, talented folk. They had to be excellent horsemen, able to travel up to 100 km in a day, skilled topographers able to navigate unmapped terrain and talented communicators; a tough combination. These were prestigious jobs, well paid and protected by official decree. ‘Don’t shoot the messenger’ was in fact law. And it wasn’t just the Royal government that employed messengers. Businesses employed them as well. Interfacing with the far traveling messengers were the town-criers, who shouted out news on everything from wars, taxes and jobs to local markets and events. 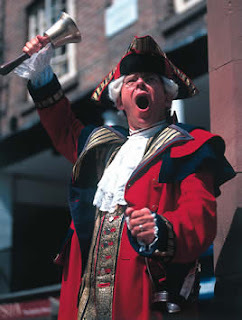 What struck me was that in England and some other parts of Europe, Town Criers were a government position, appointed by the Mayor of each town, to keep the citizens informed of matters of both national and local importance. In fact, interfering with a Town Crier in the execution of his duty was once a serious offense. The British Empire apparently took the job of spreading news and information very seriously. It strikes me what an extraordinarily powerful system this was and I would be willing to wager that the rise of civilizations and the spread of empires were closely correlated to faster mechanisms of information flow.